Etrosi, Mayor of Nice, cancels Dieudonne’s performance in Nice and takes legal action against the comedian! The Mayor of Nice has taken out an order forbidding Dieudonne’s performance scheduled for the 25th June in Nikaia. His reason – the comdian’s polemic Facebook status after the recent terrorist attacks. The Mayor went on to say that he will personally be taking Dieudonne to court for his apologist stance on “terrorism”. “After this historic march, what can I say – “Legendary” Instant magic equivalent to the Big Bang that created our universe! Or to be more down to earth, equivalent to the coronation of Vercingetorix (cartoon character). At last back home, I can say that ” Je suis Charlie Coulibaly”. For the Mayor of Nice this statement must be condemned in the strongest possible way. 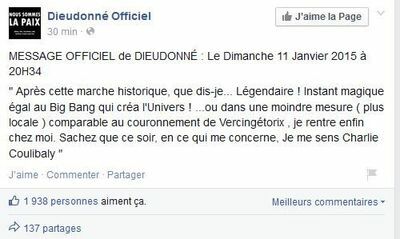 Dieudonne responds to Manuel Valls. ← Harrowing Testimony of Palestinian Girl Describing the Brutal IOF Invasion of her Home.